Every so often when a prayer concern comes into the church office for something deeply troubling, like the illness of a child or the sudden death of someone way too young to die, I feel those hurting people, and God, too, are looking for some kind of prayer deeper than words. And so I come into this sanctuary to improvise on the piano as a prayer between God and me and between God and the hurting people affected by their tragic circumstances. There is rarely, if ever, any melody to what I play or traditional chord structure, there is only the meandering of my fingers, typically in the key of B, dropping notes here and there on the black keys, with an occasional white key of B and E, forming bizarre chords that emerge out of minimalistic arpeggios, creating a clash of dissonance and harmony. My improvised prayers on this piano are one-time only, and they drift out into the sanctuary, to God’s ears, mixed together with all of the other countless prayers prayed in this place since 1866, some of those prayers even had words. While I studied music in college 25 years ago, I never took on the requisite discipline to play well. I can barely read music, and I certainly can’t sight read through a performance. When I read music it’s like when I read Korean. I know the notes like I know the letters in Korean. I have the head knowledge of the notes and where they are on the keyboard, like I know how to pronounce the Korean language when I read it, but I don’t have the motor skills and years of practice to play the keyboard well, nor do I have the conversational skills and vocabulary necessary to speak Korean well. 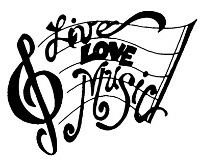 My indiscipline as a performer of music, however, has not prevented me from loving music or even composing and recording music. One of the earliest things I did for Eun-Hye was write her a poem in Korean the best I could using dictionaries and my little knowledge of Korean at the time. As with music, my indiscipline with learning the Korean language has not kept me from loving and marrying someone who speaks Korean as her first language. Sometimes we think we have to answer a difficult question before we can enjoy something. 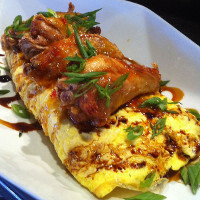 I think of the age-old question, “Which came first, the chicken or the egg?” When we’re eating zesty BBQ chicken wings or a freshly-prepared omelette, we just enjoy the feast! The answer to what comes first is: the eating! However, the food came from somewhere, and that realization is what should make us thankful for the gift of the delicious food. I think a similar realization can help us digest the Bible. For example, two weeks ago we heard the story about Jesus, the disciples, and the children. Jesus said, “Truly I tell you, whoever does not receive the kingdom of God as a little child will never enter it.” We probably tend to wonder, “What do I need to do or how should I behave like ‘a little child’ so I can go to heaven?” I suggest this passage has little to do with “going to heaven” and everything to do with “receiving the kingdom of God.” It’s not about what we have to do to get to heaven, it’s about how receptive we are to the kingdom of God. In other words, do we receive God’s work in our lives with a sense of wonder, humility, and curiosity, like little children. Let us go back to the musical analogy for a moment. Recently I saw King Crimson in concert, and at the end of the concert in the encore Porcupine Tree drummer Gavin Harrison played what to my limited comprehension was an impossible drum solo. Yet there he was, on stage playing the impossible drum solo. Did I for one moment think to myself, “Man, did I blow it by giving up music performance because I want to play like that!” No, I sat there in utter and awesome wonder, purely receiving his amazing gift! How about today’s story? “‘Give therefore to the emperor the things that are the emperor’s, and to God the things that are God’s.’ When they heard this, they were amazed; and they left him and went away.” Trying to digest these words of Jesus, people probably got “spiritual indigestion.” Some who heard this were amazed because they knew God created everything, but they didn’t get it that Jesus would say some things belonged to their imperial overlord, the emperor, and some things belonged to God. Others were amazed because they were scared by Jesus’s direct challenge to the emperor’s reign because he implied the emperor does not control everything, and that’s why they “left him and went away.” They didn’t want to get executed for his rebellious speech. Still others were amazed because for the first time they heard there is a God above the emperor as god. Other people were amazed because Jesus gave a politically correct answer by suggesting paying taxes were important to do, which would not have sat well with the revolutionary types. I think we may chew too much today’s story. To our ears, in our time, we may hear a message about linking of paying taxes with stewardship as the church, as revealed in the humor of the cartoon on the bulletin cover this morning. The message appears to be, God owns everything, therefore we should just as easily see our giving to the work of the church as an obligation, as we do with taxation. I think, however, that Jesus was teaching people to separate the pressure of obligation to the state from their devotion to and worship of God, which has to do with the whole person. The cartoon speaks to something inside us, deeper than a sense of obligation; it speaks to our God-given image as givers. God gave everything in the person of Jesus, so we, too, give ourselves to others. Jesus was teaching people to separate the pressure of obligation to the state from their devotion to and worship of God, which has to do with the whole person. 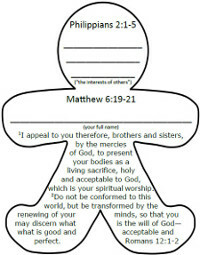 This week I want to encourage you to spend time contemplating how you bear the image of our loving and giving God by having the faith of a little child, by innocently using the gingerbread man cutout insert as you contemplate your life and cut away all of the things that bog you down. Please feel free to do this as a family or as an individual. Write on the front of the page outside the outline all the stuff of life that may be bogging you down with obligations and worries. Next, write down something in the head that you care about, that you would like to see more healing for, that has to do with others, not you, others. Then write your full name on the torso. Next, slowly cut out your image and think about how you’re cutting away all of those obligation and worries. Then, hold up your image to the light. You will see God’s loving and giving heart shining through on your name, and you will see the collective faith of the many members of the church. Finally, read the Bible passages in Philippians and Matthew and the Romans passage printed on your image. Spend some time reflecting on your experience. Next Sunday is Consecration Sunday when you will be asked to make your financial giving commitment to the work of God’s kingdom through Plainfield United Methodist Church. You already know the many ministries of this local church. You already know this local church is an oasis of God’s love in an increasingly secular society full of self-interest and anxiety. It is not necessary for me or anyone else to convince you that you all, Plainfield UMC, are doing mighty works of kingdom-building. You already know these things. By next Sunday through contemplating yourself as made in the image of God, having cut away all your obligations and worries to receive life as a little child, you will have communed your image with the image of our loving and giving God. Please pray about what percentage of your income you will devote to the work of God’s kingdom as the church in this local assembly of the body of Christ. This percentage is your first act of giving. This percentage represents for yourself and to the world that you and we are all made in the image of a loving and giving God. Please prayerfully consider that your giving is as the church and not to the church. You are the church doing God’s work in a world desperately looking for selfless giving and love. I may not be the talented musician I wanted be 25 years ago, but when I married Eun-Hye nearly 15 years ago I knew I had to give 10% of my income as an expression of my faith and commitment to the work of Christ’s church. It has been the simplest discipline I have ever practiced. This discipline of giving has transformed my self-image as a consumer into a giver. In the terms of the musical analogy, my discipline of giving has transformed my self-image as an audience member into an instrument for God. By giving your first fruits through the work of this church, you will joyfully and fervently play your life as an amazing instrument for God! In the words again of Charlie Parker, “Don’t play the saxophone. Let it play you.” Amen.